Experimental archaeology is an activity in which archaeologists try to re-create or re-enact past technologies or cultures in order to help understand them. In that spirit I decided to try to create (re-create) a nailed boule, a boule cloutée. In ancient Egypt, Greece, and Rome, boules was played with balls made of stone. In Europe, after the decline and fall of the Roman empire, balls were made of wood. In France in the 1800s, the wood of choice was boxwood (buis) root, because it is a hard and heavy wood, although beech (hetre) and elm (orme) were also used. The boules took a beating during play, so boules manufacturers started re-enforcing the wooden boules with nails. As the art of nailed boules developed, more and more nails were used until eventually the entire surface of a boule was covered with nails. These were the “nailed boules” (boules cloutées) that were produced in France during the 60-year period between roughly 1870 and 1930. The village of Aiguines was especially noted for producing them. 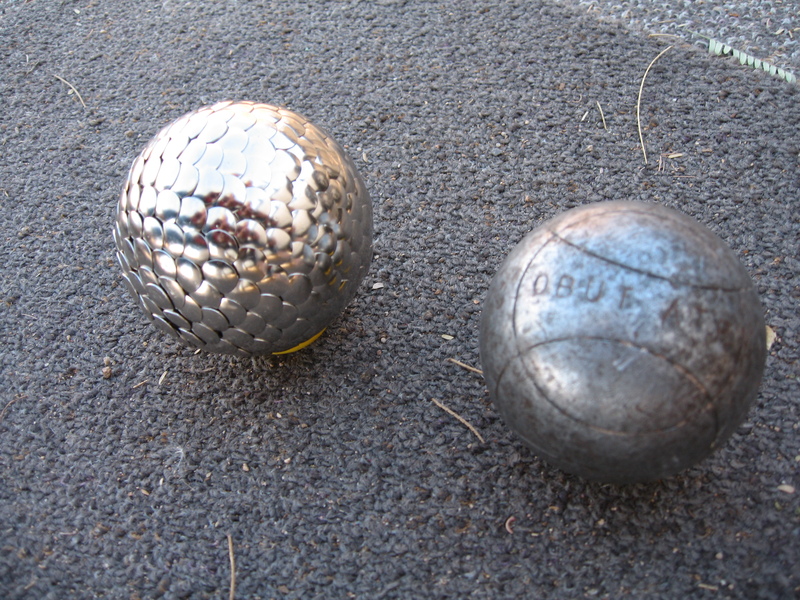 There were two styles of nailed boules. 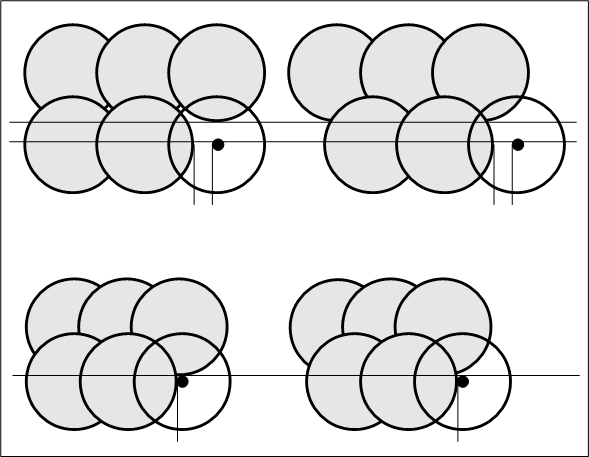 The earliest nailed boules used nails (clous) with thick heads juxtaposed in a side-by-side pattern (cloutage juxtaposé), like cobblestones (en pavés). Nowadays, on a computer screen, this would be called a “tiled” layout. The other style used broad, flat-headed nails applied so that the heads overlapped, like fish scales (cloutage en écailles). Typically, turning the wooden sphere on a lathe was done by a man, while the nailing was done by a woman, une ferreuse. As their craft became more sophisticated, the ferreuses used nails of different metals (iron, copper, brass) to create colored designs on the boules. They also used nails with heads in different shapes (round, square, diamond). It was possible to make simple designs in fish-scale nails, but tiled nails were the best for making sharp, detailed designs. 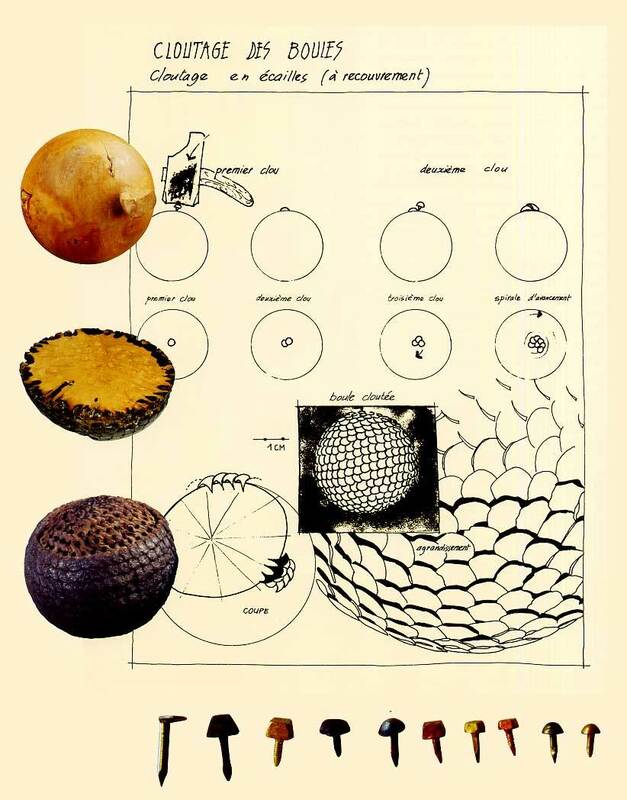 The designs were both decorative and used for identification purposes. It took a lot of nails to make a nailed boule. 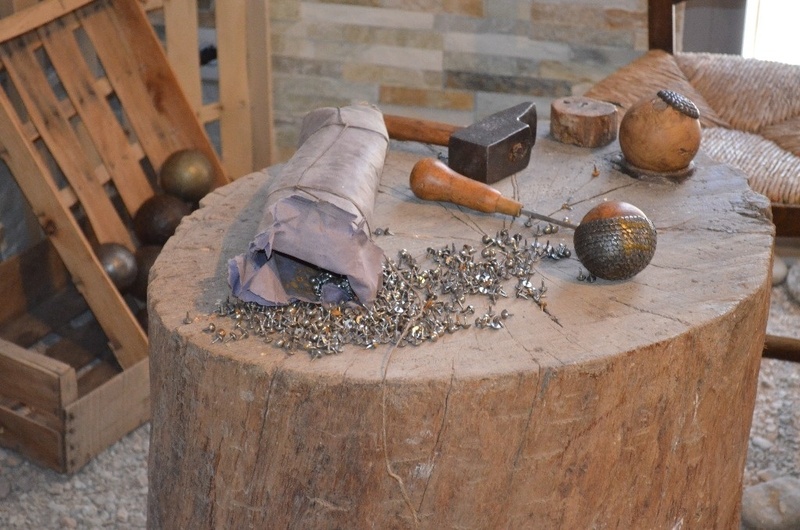 Depending on the size of the boule, the size of the nails, and the style of nailing, it might take anywhere from 800 to 1800 nails to cover a boule; the average was probably around 1000 to 1200 nails. 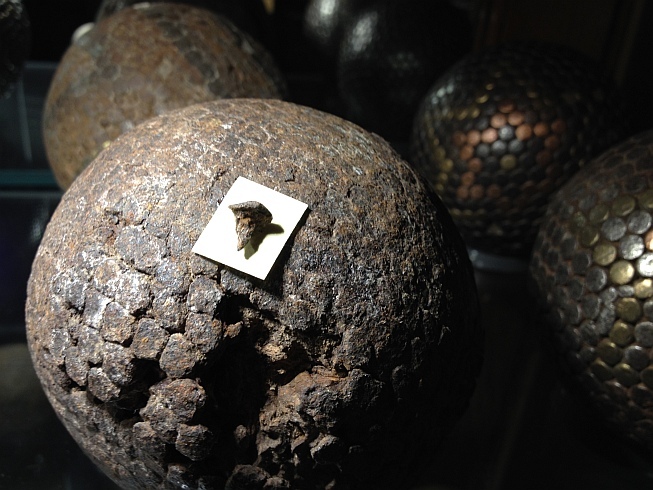 Pictures of old nailed balls, and of nails from damaged balls, show both hand-forged nails with square shanks and machine-made wire nails with round shanks. For juxtaposed nailing the nailers used what we today would classify as upholstery nails, with short shanks and raised heads in a variety of sizes, shapes and colors. Today, upholstery nails have hollow domed heads, but pictures suggest that the old-time upholstery nails had solid heads, making them bigger, stronger and heavier than today’s upholstery nails. We can reasonably guess that many nailed balls were made with nails that were commercially available off-the-shelf at the time. How did a nailer hold the nails? Old photos don’t show us how the old-time nailers did it. 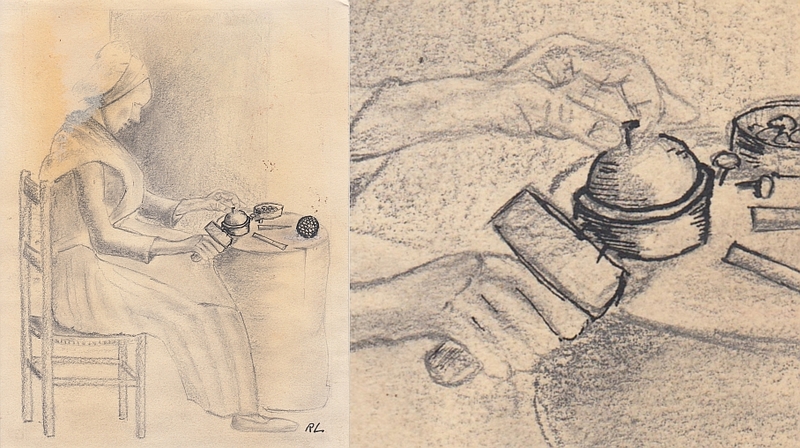 The natural assumption is that the nailer held the nail in her fingers while she hammered, as depicted in this drawing by Roger Lacombe. But for a nail with a short shank it would be almost impossible to hold the nail between your fingers without smashing your fingers while you hammered. And your fingers would block your view of the spot on the boule where you wanted to position the nail. To me, it seems likely that the nailer used some kind of thin tool slipped under the head of the nail to hold the nail. She would use a first blow of her hammer to drive the nail part-way in, setting it. Then the tool would be withdrawn and she would use a second blow to drive the nail home. I’ve looked for evidence of such a tool in photos that I’ve found online, but haven’t found anything that would really settle the question. Some photos show blurry images of oblong tools on the cepoun, but the pictures aren’t clear enough to make a positive identification of all of the tools. Eventually I decided to do an experiment. I would try to re-create a nailed boule, and try to see if I could figure out how the nailer held the nails while she hammered. To begin my experiment, I went down to my local woodworkers supply store and bought several 3-inch wood balls. I used one of the balls for experimental and learning purposes, and the others for my real attempts. I went searching for nails and tacks at my local hardware stores, and also on the web sites of hardware vendors. I found upholstery tacks with round heads that would be a good way to recreate the bumpy appearance of the early nailed boules. I also found carpet tacks (with short shanks and very small heads) that would be a good way to recreate the sharp designs of some of the nailed boules. But when I tried to do juxtaposed nailing with these tacks, I discovered that juxtaposed nailing is very difficult to do well. As a result, I abandoned my plan to attempt to do juxtaposed nailing, and decided instead to attempt to do fish-scale nailing. I tried using roofing nails, but I found that the long shanks made them very difficult to drive. After a roofing nail began to split the wooden ball that I was working on, I stopped experimenting with roofing nails. That left me with very few options. Virtually all mass-manufactured nails today are made to be used as fasteners, which means that they all have long shanks. Short decorative nails are available, but they are expensive. That left only one affordable option: thumb tacks. Thumb tacks are approximately the size and proportions of the short hand-forged nails used in the old nailed boules. Unfortunately they are much thinner than true nails, and the head and the shank are two separate pieces that are welded (?) together. That means that a thumb tack is much lighter and weaker than a real nail. 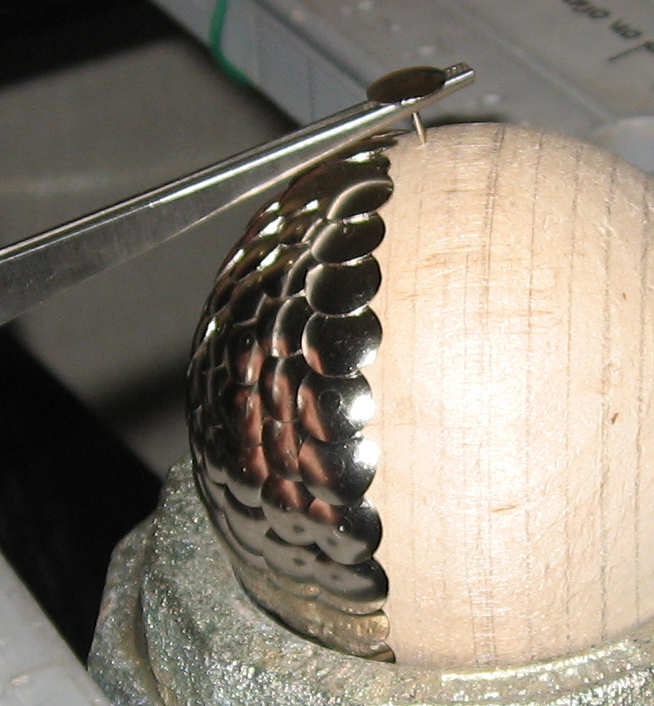 When a tack is hammered, the hammering must be done carefully, straight down onto the center of the tack. If it is not, the shank of the tack will bend, leaving the head of the tack in the wrong place or the head of the tack might break off. In the old days, the nailer’s tools were pretty basic. 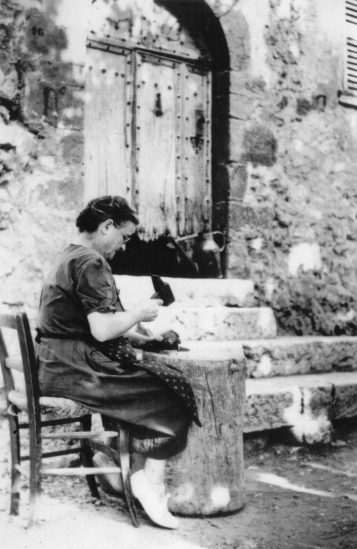 There was a workbench called the cepoun, which is Provençal for “stump” or “pillar”. It was an old tree stump. On the cepoun was the rond de cepoun, an iron ring used to hold the boule while it was being worked on. The nailer used what appears to be a hammer with a large heavy head and a very short handle. For my workbench, I used a handy folding workbench. At my local scrap metal yard I found an iron pipe-fitting that made a good rond de cepoun. My hammer was an ordinary general-purpose carpenter’s hammer. My biggest problem was finding some kind of tool that would allow me safely to hold a nail in place while I hammered it. Upholsterers use a thin, flat plastic tool with a magnetic notch in the end that loosely holds the tack, but that would be too slow and clumsy for my purposes. 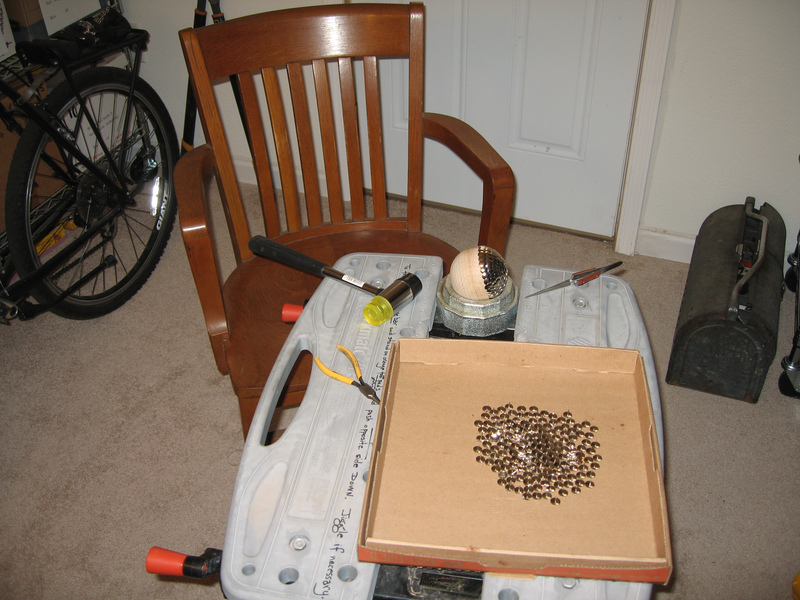 And of course a magnet would not hold a brass or copper nail. In a store that sells jewelry-making tools I found a pair of cross-locking tweezers (also known as reverse-action tweezers). You squeeze the tweezers to open the jaws and pick up an item. When you release the pressure, the tweezers close themselves and hold the item. With cross-locking tweezers, I wouldn’t have to worry about gripping the tack at the same time that I was trying to maneuver it into position; the tweezers would automatically do the gripping for me and I could concentrate on positioning the tack. The actual process of driving the nails is not complicated. Holding the tack with the tweezers in my left hand, I position the point of the tack over the spot where I want to drive it in. One moderate whack with the hammer drives it part-way in, setting it. I squeeze the tweezers to release the tack, and I pull the tweezers away. Finally, a gentle whack or two of the hammer drives the tack home. After some practice, I learn where to position the point of the tack in order to get the tack’s head into the place where I want it. Sometimes I hit the tack off-center: the shank bends and the head of the tack ends up out of position. I use my knife and pliers to pry up the bent tack. I drive in another tack to replace it. Then I go on to the next tack. I did not draw a pattern or design on the boule before driving the nails. The earliest nailed boules (such as the boule on the left in the first picture in this post) had nails set far apart in a regular geometric pattern. For such boules, a design consisting of circles was cut into the ball by the wood turner. For doing a complicated design using juxtaposed nails of different colors, a ferreuse would have pre-drawn a design on the boule. But for fish-scale nailing you don’t need a design. You just drive the first nail, then continue driving additional nails— each nail overlapping the previous nail— in a spiral from the top of the boule to its bottom. Over time I discovered two things. First, you really have to pay attention to what you’re doing. 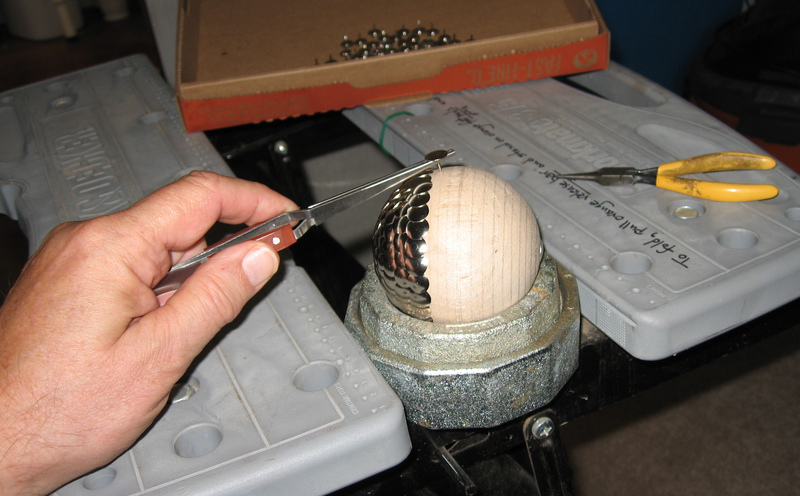 While nailing, it is important to bring the head of the hammer straight down onto the center of the head of the tack, driving the tack straight down into the wood. If you don’t do this, the tack will bend or break. Second, driving the tack straight down into the wood is difficult. You are working with a curved, spherical surface, usually moving it into a new position after each nail is driven. The direction straight down changes with each nail and it is necessary to make small adjustments to your hammering motion for every nail. I found that in order to do the nailing with the necessary degree of precision, I had to hit with a motion of my wrist rather than my elbow, and in order to do that I had to hold the hammer very close to its head. So now I think I understand why the hammers of the old-time ferreuses had such short handles. With trial-and-error I discovered how to do fish-scale nailing in a way that is aesthetically pleasing. The trick is to decide how much you want one nailhead to overlap a neighboring nailhead. Then you drive each nail with a certain amount of space between the shank and the edge of the nail that you just finished driving, and the same amount of space between the shank and the “baseline” of the previous row of nails. A moderate amount of space (top) gives a moderate amount of overlap of the nail-heads without leaving gaps between the nails. 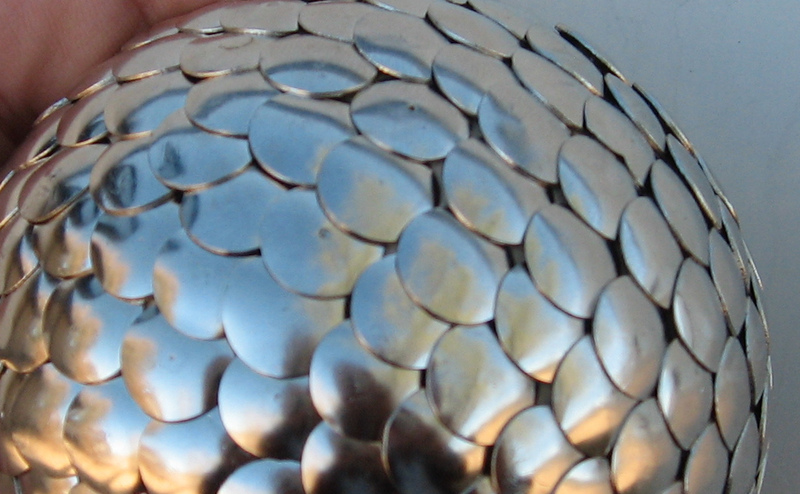 This is the style that most fish-scale boules use. The minimum amount of space (bottom) is zero— it maximizes the overlap of the nail heads. 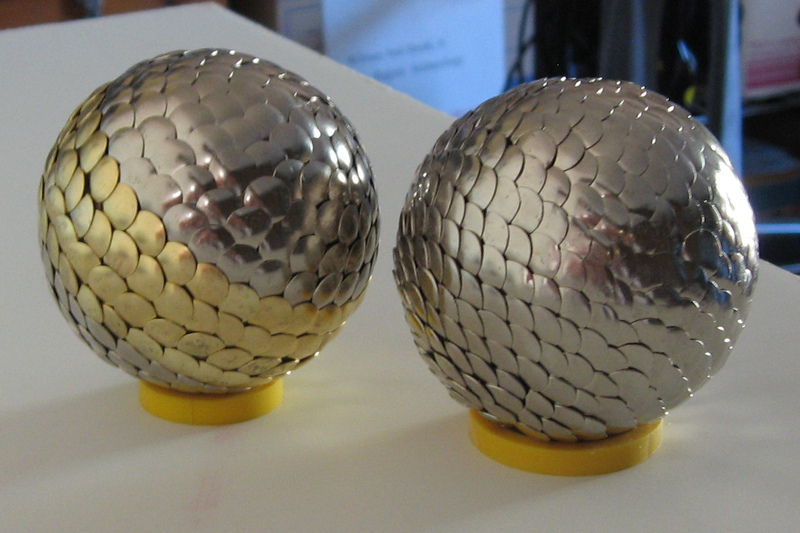 Most fish-scale boules use a moderate amount of overlap. This gives a pleasing aesthetic appearance to the boule. This is the style that I used in my first boule. My first boule cloutée and a 75mm Obut boule. When I finished my first boule, I liked the look, but the boule felt very light. 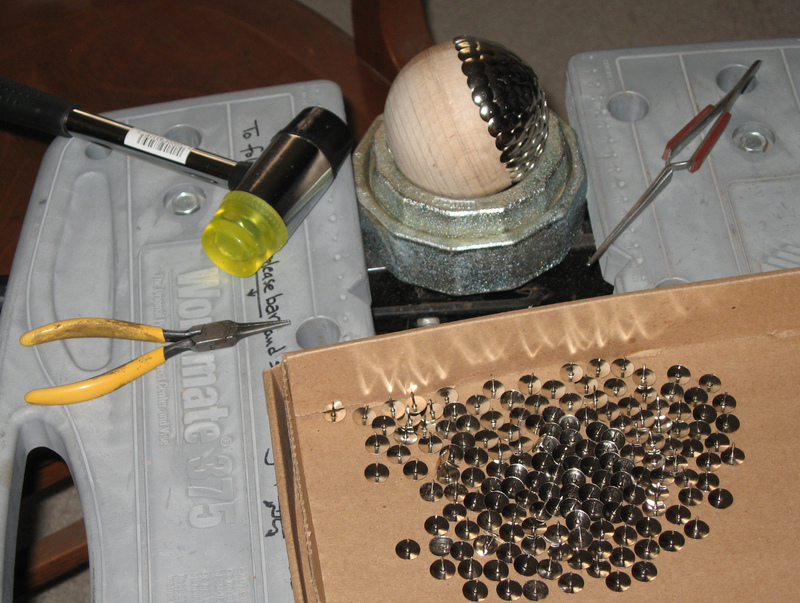 On my second boule, I nailed the boule with the maximum possible amount of overlap of the nailheads, so that the ball would carry more tacks and be heavier. Here are the two boules. The one on the left weighs 273g and feels very light, like a wooden ball. The one on the right weighs 353g and feels heavier and more substantial in the hand, like a real boule. This made me think that, since iron weighs much more than wood, most of the weight of a nailed ball came from the nails and very little from the wooden core. But Pierre Turbang pointed out to me that— when the wood is boxwood root— the weight of the wooden core does make a significant contribution to the weight of the boule. Boxwood root is very hard and dense. Pierre noted that in a pair of old balls with similar (although widely-spaced) nailing and a diameter of 97mm, the difference between a boxwood core and a non-boxwood core is 790g vs 460g, a 330g difference. Perhaps, I began to speculate, the old boule-makers preferred boxwood root because of its density as well as its hardness. I had always assumed that boule-makers used nails to reinforce the surface of the boules, but… could they have started adding nails in order to increase the weight of the boules? 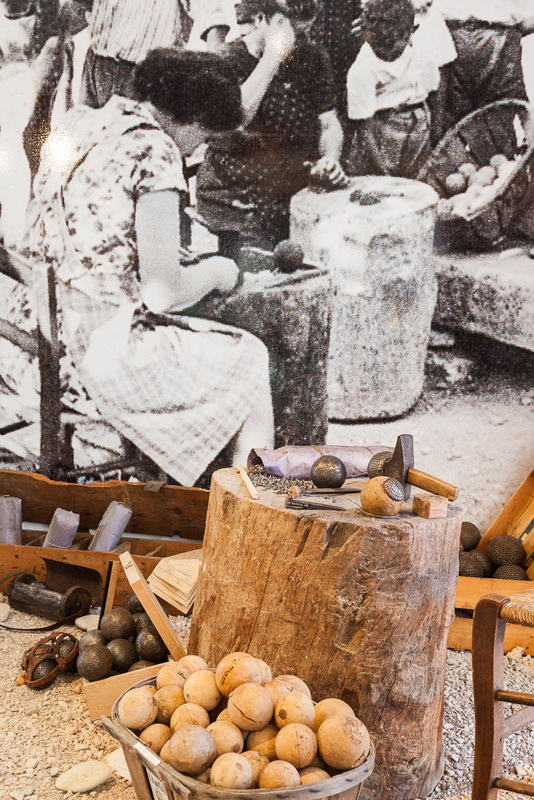 That would explain why many of the original boules cloutées used nails with very thick, heavy heads, and why, once the idea of a nailed boule occurred to people, they quickly moved to cover all of the surface with nails. I had hoped to be able to make a nailed boule that would be comparable in size and weight to a modern petanque boule, but after seeing how light my nailed boule was, I was disappointed. 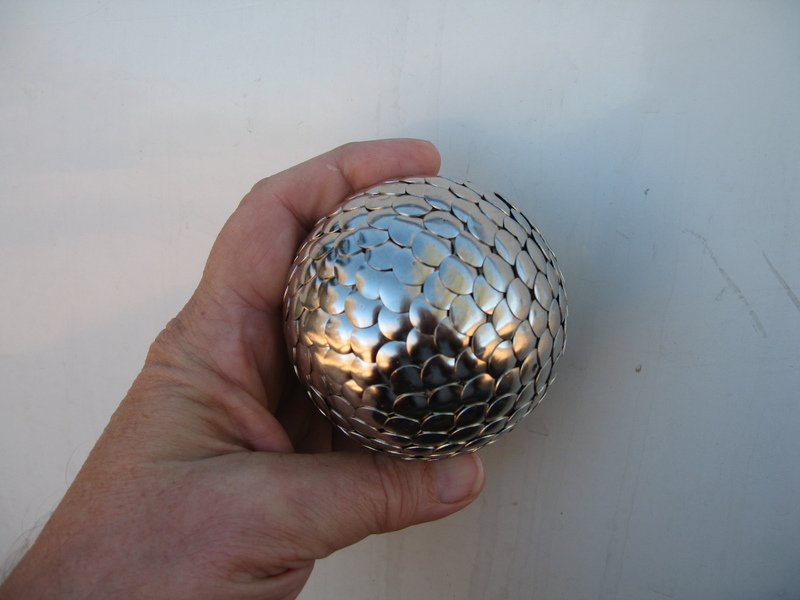 (Modern petanque boules probably, on average, are approximately 73mm in diameter and weigh approximately 680g.) But then it occurred to me that I might be making a mistake. 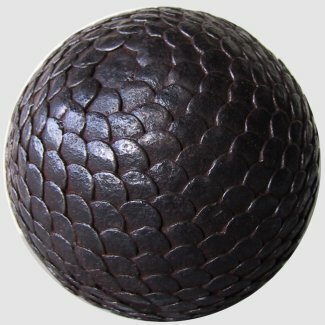 If I recreated a typical nailed boule, how heavy would it be? I consulted Pierre Turbang’s web site, which very helpfully reports the size and weight of several nailed boules. The first 3 boules on the list are comparable to the size to a modern boule, but weigh much less. 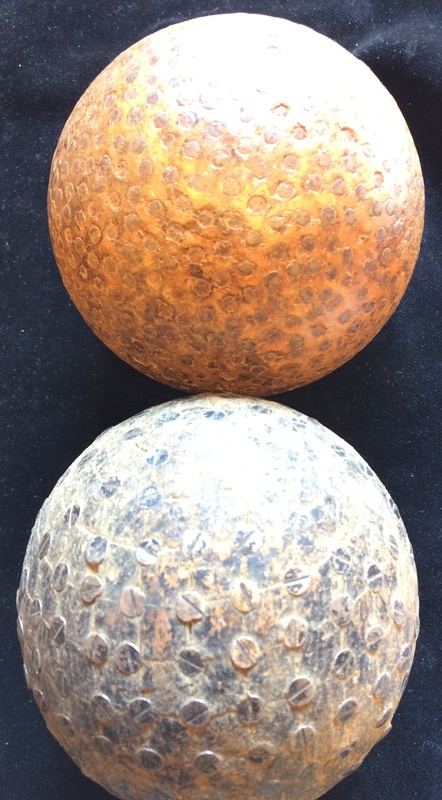 The last two boules are of comparable weight, but are much larger. My boule was 80mm and 353g. That is lighter than a comparable boule cloutée, but the difference in weight is much less than the difference from a modern boule. It looks like the original boules cloutées were considerably lighter, for their size, than modern boules. 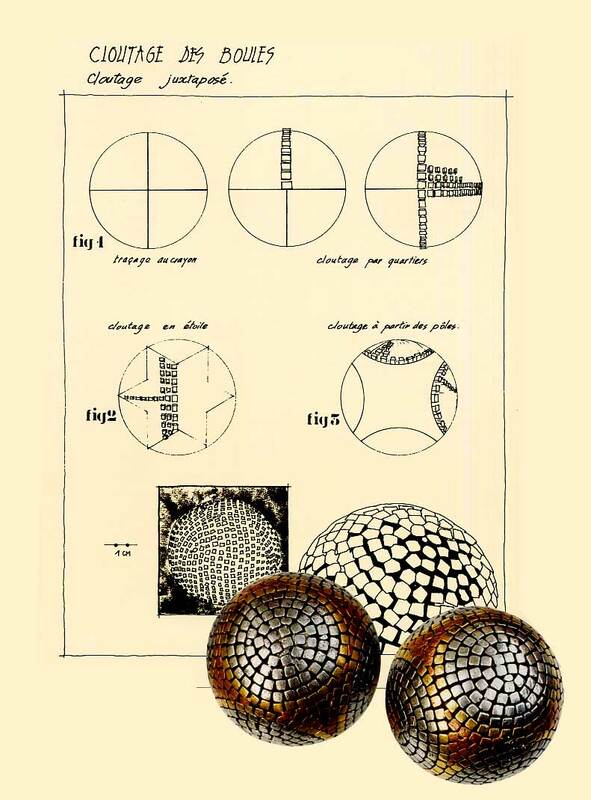 In any event, thinking about the relative weight of the nails and the wood, I began to think of a boule cloutée not as a wooden ball but as a metal ball built around a wooden core, with the wooden core’s primary function being to provide an anchor for the shell of nails. In effect, the nails were the boule, and the boules cloutées really should be regarded as first-generation metal boules. I was curious to see whether my re-created boules would be strong enough to withstand the rough-and-tumble of actual play. In fact, they seemed to do just fine in the few games that I played with them. Their main disadvantage was that they were so much lighter than the other boules that they were easily muscled aside by the other boules. They would have fared better, I think, in a game where the other players used real boules cloutées; the weight difference would have been less. My original reason for this experiment was to answer the question “How would I hold a very short nail while hammering it?” My answer— which turned out to be rather effective, I thought— was a pair of cross-locking tweezers. Tweezers are an effective solution to the problem and they are not a new or complicated technology— they certainly would have been available to the old-time ferreuses. Some other kind of tweezers, or a pair of needle-nose pliers, would have worked almost as well. Unfortunately, I don’t know of any evidence that the old-time ferreuses used such a tool. Perhaps someday I’ll visit the Musée des Tourneurs sur Bois in Aiguines and ask the curators what they think.